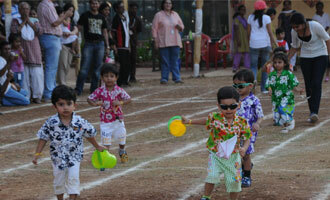 MET Rishikul Vidyalaya hosted its 8th Annual Sports Day with an epitome of displaying values of sports in true sense. Annual Sports commenced with the primary and secondary section on 3rd December, followed by the playgroup babies and concluded with the pre-primary section on 4th December 2011. Over 500 students participated with full verve and vigor.